"Nyuenshiki" (entrance ceremony). 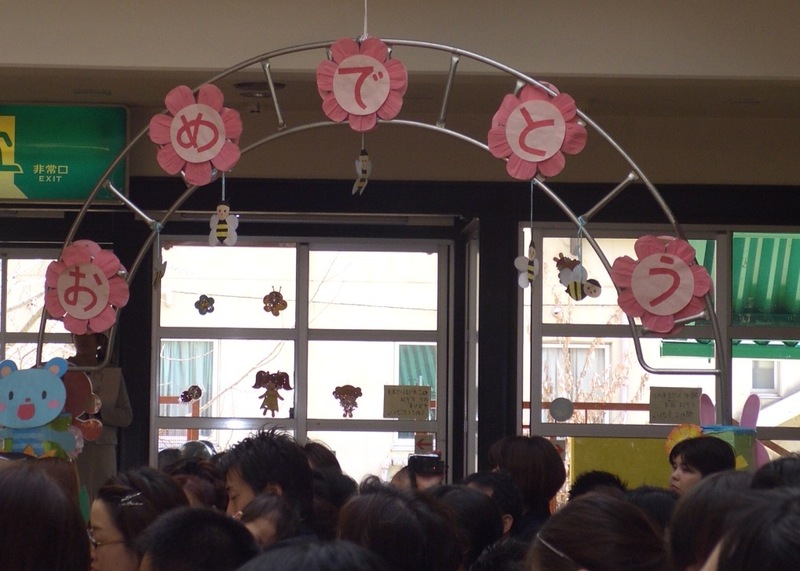 The sign reads "omedeto" (congratulations). Starting April 1st this year (the beginning of the school year in Japan), I went back to work and my daughter started her first year at a nearby private nursery school. Even prior to the official first day, we attended an “entrance ceremony” (nyuen-shiki) complete with teacher and administrator introductions (a bit too long for most 2 and 3 year olds) and a couple of songs for the kids. Followed by a photo session. We later paid a few dollars for nice photographs taken by the nursery school’s contracted photographer, both posed and random shots during the ceremony. To be honest, I was totally confused by the Japanese nursery school system and left most of the paperwork up to my wife. Second, there are two kinds of categories for nursery schools (both public and private). The first is termed “officially recognized nursery school” (ninka-hoikusho 認可保育所) and the second is termed “not officially recognized care facility” (ninka-gai-hoiku-shisetsu 認可外保育施設). I’m unclear what constitutes “official” approval. But there are some obvious differences between the two types. Last year, during my child care leave, we occasionally left our daughter at an “unofficial” daycare that called itself a takujisho (literally, “entrusting infants place,” 託児所). The daycare consisted of two rooms – a play room and a sleep room – and often had up to 20 kids with ages ranging from 6 months to 6 years. We had to provide snacks and lunches each day. The current “official” nursery school (a private school affiliated with a nearby Buddhist temple) provides all food and drink. There are also separate rooms for age groups (again, 6 months to 6 years), with some ages having two separate rooms. For example, our daughter is placed in “Squirrel 2” because she was not quite 2 years old in April, while kids already 2 years old were placed in “Squirrel 1.” There are also many, many more teachers at the nursery school; at our daughter’s age, there’s basically one teacher for every 4 kids. The “unofficial” daycare had only 4 teachers total for all age groups. Of course, the official nursery school is much more expensive, but it’s also much safer and the facilities are much larger. The main drawback to the “official” system is the lottery system. We were rejected from the previous year’s lottery system, but because we were rejected we were selected this year…although we didn’t have any choice whatsoever as to which of the local six or seven “official” schools our daughter could attend. Considering the thousands of kids in some parts of Japan that are still on the waiting list for nursery school, we got off lucky. Kindergarten (youchien 幼稚園), on the other hand, starts at 3 years old and is considered to be a sort of elementary school preparatory program…although not technically part of the system (and not required, either). And it only lasts roughly half a day (some places go to 2 or 3 p.m.). Many kindergartens are affiliated with elementary schools…some of which lead directly to prestigious universities. In one well-publicized case, a mother in Tokyo actually strangled her rival’s 2 year old, because the rival’s child got into a prestigious kindergarten, while hers did not. To my knowledge, there are far more “normal” kindergartens than so-called “prestigious” ones, but the lure of a school that helps kids learn to read/write and do simple calculations is strong. But for us, since both my wife and I work full-time, sending our daughter to only a half-day kindergarten program is pretty much out of the question. Unless one of us were to quit full-time and move to part-time work. We’re concerned that the nursery school is primarily aimed at “taking care” of children rather than “educating” them, as is the kindergarten…but on the other hand, what kind of “education” can kids get that at such a young age? Our daughter can already read the entire English alphabet, and with all the books we have at home for her, I have no doubt that she’ll be reading words and even sentences before long (she can already read “cat” and “dog” at the age of 2 years 4 months). There is a proposal in Japan to combine the nursery school and kindergarten system into what has so far been labelled “kodomo-en” (basically, kindergarten…こども園). A few “kodomo-en” have been established, but the requirements for teaching licenses (which include basic medical and nutritionist training) are complicated, to say the least. Seems strange that given the declining number of children in Japan that there should be an increase in demand for full-time daycare, nursery school, and kindergarten. But by and large the nursery school system seems well-run. Maybe in the next post I’ll be able to explain a little about how our local school works (as best I can figure out!). Long ago, I gave up my high school dreams of becoming the next Carl Sagan and instead wound up working (in order) at McDonald's, a '60s-themed restaurant, a video rental store, a used bookstore, a computer seller, Kinko's, a Jewish newspaper company, and an HR firm. I eventually became a teacher of intercultural communication in Kyoto, where I vainly attempt to apply quantum mechanics to language teaching, practice martial arts and Zen Buddhism, and always keep one eye on the sky. This entry was posted in day care, Japan, parenting, Uncategorized and tagged child care, child education, child-raising, day care, education, fatherhood, half-Japanese, Japan, Japanese, kindergarten, nursery school. Bookmark the permalink.